Newgrange Gold Rapeseed Oil is produced in the heart of the Boyne Valley, Co. Meath. The oils are grown, pressed and bottled entirely on the Rogers family farm which looks across the River Boyne at the passage tomb at Newgrange, delivering an oil that is 100% traceable. 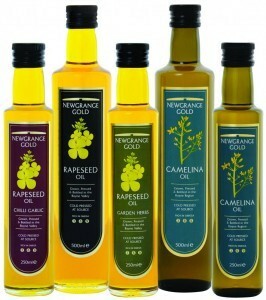 Newgrange Gold is the first company in Ireland to launch Camelina Oil – high in omega 3, Vitamin E and anti-oxidants. Newgrange Gold’s Camelina and Rapeseed oils are an excellent alternative to olive oil for use in cooking, dressings or as a supplement. Newgrange Gold will be appearing on Nationwide on RTE1, Wednesday 22nd of May, at 7pm.